The Port of Tacoma is a major North American seaport that recently sought a way to publicize a new IT initiative to its 250 employees. They decided to use a digital signage system from StrandVision and immediately saw the potential to make it a core employee communications tool. The Port of Tacoma is a major North American seaport handling nearly 1,200 vessel calls and more than $36 billion in trade annually. Its 250 direct employees provide administrative services, maintenance and security for Port terminals and other industrial facilities. The need for a digital signage network was first articulated by the Information Technology (IT) Department, which wanted a way to keep the staff informed about a major software initiative called the Integrated Management System (IMS). However, as they learned more about what digital signage could do for them, they recognized its greater potential. Explained Diane Jordan, IMS Communications Specialist, "We wanted to keep people informed about IMS schedules, but we soon realized that we could use it for other purposes. Now, any information that needs to be communicated Port-wide is quickly and efficiently handled over the digital signage network." The IT staff researched digital signage providers and selected StrandVision for its ease-of-use, low cost and flexibility. The IT and maintenance staffs installed five 50" plasma monitors - two displays in the main administration building, one in the engineering project office, one in security and one in the maintenance break room. They used a variety of networking technologies, including a high speed wireless network, to reach the various buildings. An in-house photographer and graphic designer developed the Port's template that StrandVision installed on the digital signage server. The attractive template features a watermark background. Employee involvement was key, and it started before the first digital sign was turned on. The Port ran a naming contest that drew about 150 entries. The entries were narrowed down to five and ultimately Port News Network was selected. The contest was successful on several levels since it encouraged employee involvement and raised awareness in anticipation of the new digital signage system. Now, Port of Tacoma regularly broadcasts notices about special events, Human Resources topics, retirement parties and commission meeting schedules. It also posts the Port Vision, Mission and Goals, motivational messages and answers to employee questions and suggestions. Although the digital signage is employee oriented, the messages are all appropriate for public viewing. Said Diane, "We keep in mind that we have guests in the buildings and that the public may see the monitors." Diane, who participated in a one-hour Webinar training session with StrandVision, posts updates about once a week but makes minor adjustments often. "I'm in it pretty much every day - two to three minutes - to change something or add something, and then I'm out." 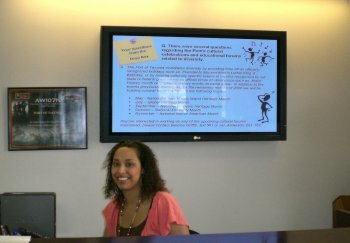 Diane appreciates the StrandVision Digital Signage system. "One of the things that's nice about it is that it's available to everybody at the same time. We don't have to go through the courier or the mail system. We save a lot of paper since we don't hand out flyers for everything now. "Most of the employees really like it. We've had a lot of really positive remarks. People are getting used to looking to the Port News Network for information," she concluded.